This has been about the 132nd time in my life that I thought I was done with a little book called THE MAZE RUNNER. It's amazing how many loops this story has gone through on its journey to publication. It'll be a fun topic for future writer's conferences. Anyway, with great relief, I emailed the manuscript to Krista today. I have no doubt that the last 2 weeks have been the most grueling I've ever had in terms of pure nitty gritty working on a book. I'm not asking for pity - I enjoyed it for the most part. But it was intense. You'd probably be somewhat impressed if someone wrote 15,000 words in 2 weeks. If not, you have an avocado for a brain. But not only did my manuscript increase by 15,000 words, it was done in bits and pieces, here and there as I went through Krista's notes, page by page. No wonder I had a head ache every night! But I'm really surprised how much I enjoyed doing it. Some days were tougher than others, but the lessons I learned from Krista are just amazing. And the book is much, much better now. 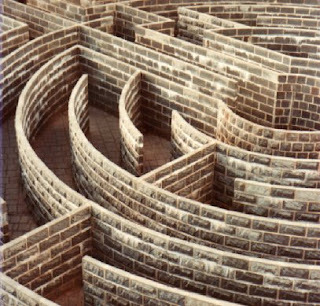 The very first version of MAZE was 68,000 words long. When I turned it into Krista in September, it was 87,000 words. The one I submitted today is 102,000. That means the book is 50% bigger than its original version. That blows me away. The biggest difference is DEPTH. The basic storyline hasn't changed that much. But the depth of the characters, the depth of the worldbuilding, the depth of the dialogue and scene development, the depth of everything is just more... in depth. How's that for articulatregery? I just made that word up, and yes, you have permission to use it. Ah, I feel so good. Tomorrow my family and I head off to Georgia for a 2 week vacation with Georgia Grandma and the rest of the Dashner Crime Family. I've sworn off any booky type work unless Krista gets back to me with more revisions, in which case I will abandon my mother and work like a... worker bee. (Mmmm, more good articulatregery. Oh, and just kidding, Mom.) But I think it will be mostly R&R. Well, I hope all is well, and for your personal safety, I truly hope you are not a turkey this time of year. See ya again soon! P.S. A big congratulations to my awesome agent, Michael Bourret. He was recently promoted to be the Vice President of his agency, Dystel & Goderich. I'm honored to be his client! Mmmmm, Rewrites. And Random Thoughts. Just letting you all know that I'm still alive. THE MAZE RUNNER rewrites are going well, although I know for a fact I've never put so much time into a book before. I think you'll find that it was time well spent. Krista's notes are exhaustive, thorough, and many. She is one smart lady! To give you some perspective, I'm averaging about 7 pages an hour to go through her notes. I just want to make sure I respond to all her concerns and suggestions to the best of my ability. Honestly, I don't know how I would've done this if I still had that pesky job! Atlanta Hawks, 5-0. Atlanta Falcons, 6-3. Georgia Bulldogs, 8-2. Life is good in the sports world. I can't wait to see the new James Bond movie. 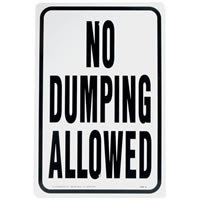 Why do you see "No Dumping" signs in public places like graveyards? I don't think the kind of people who would dump their old couch inside a cemetery are going to see the sign and say, "Well, garsh, Mabel, looks like we's best find us another place, dontcha reckon? I hear the swamp's got some space." If you live in Utah, I'll be at the West Jordan Barnes and Noble on Tuesday night at 6:00 and the Murray Barnes and Noble on Thursday night at 6:00. Come see me! I love THE OFFICE. Have I ever told you guys that? It's the best thing that's happened to TV since SEINFELD and LOST. Oh, and 24. These 2 kids come by our house on Saturday and ring the doorbell. They're holding rakes. 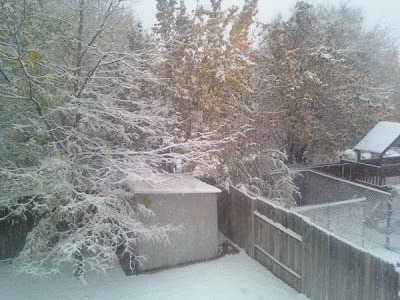 My front yard had roughly 56,738,492 leaves in it, just a few days after being swept clean. They asked me with a straight face if we'd give them 5 bucks for raking it. They weren't joking. We gave them 10. I'm rereading THE WHEEL OF TIME in honor of my good friend, Brandon Sanderson. I quit around Book 7 a long time ago because I didn't know if it would ever end and I was sick of waiting. But since he's finishing the series, I'm giving it Shot #2. And I must say, I'm really enjoying them. Very much. I thought of another few things to yap about. First, I'm very excited to announce that my wife and I will finally be witnessing the musical event known as WICKED. It's coming to Salt Lake City, and after almost 3 hours of repeatedly dialing a phone number, my wife got through and scored us some early-release tickets. Can't wait. Ironically, the word WICKED is very important in my upcoming book, THE MAZE RUNNER. No connection. Second, I put a new Followers thing on the right side of the blog. Check it out and join! Third, I found the first place you can preorder Book 2. Click on the cover picture to the right and it'll take you there. Fourth, I've been working so hard this week on my rewrites! And I've still got a long way to go. But I'm amazed at how much better Krista is making this book. I almost feel guilty, like her name should be on the cover with me. That can only mean that skiiing is not far behind. Have a great day! Ketchup, or is that Catch Up? Well, hi there! Thanks for all the emails, phone calls, texts, and comments telling me to shape up and blog. Sorry about the delay - I just felt like I was saying the exact same thing over and over again: I visited some schools, I did a signing, I toured the town. Blah blah blah. Aren't you guys sick of that yet? No? Aw shucks. Okay, then. The last couple of weeks, I visited some schools, did some signings, and toured some towns. It was fun. Good enough? Alright, let's play Catch Up. 1. South Carolina was great. I really enjoyed the schools, and I had a good time walking along the beach, finding seashells for my kids, and touring the old town of Charleston. Oddly, I think my favorite moment was watching this huge freighter ship mosey on by through the harbor. For some reason I love huge ships. 4. Last Thursday I received my editorial comments from Krista Marino, my editor for THE MAZE RUNNER. Woo boy! Do I have a lot of work to do. Nothing too major, but a lot of little things that are going to make this book much, much better. I already suspected this, but Krista is a genius, and EXTREMELY thorough. I'm not in the least but surprised she's a senior editor at Random House. Wow. 5. I don't really think you're supposed to see this, but . . . hey, it's on the world wide web, what can ya do? 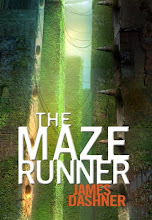 The guy who did the artwork for the cover for THE MAZE RUNNER has put it on his website. His name is Philip Straub, and he does amazing digital stuff (more apt for the teen crowd). Wanna see what's gonna be on the cover? Well, then quit sittin' there like a wart on a toadie and CLICK HERE. Isn't it awesome! He nailed the feel of the book itself. I love it. 6. Halloween was once again a success - my kids got ridiculous amounts of free candy from complete strangers. My wife claims it's been proven that sugar doesn't make kids hyperactive. Yah. I believe that one. 7. Today is Election Day. Go and vote!!!!! And don't ever, ever be ashamed of who you choose or what you vote for, as long as you believe it's the right choice. Ain't America great? 8. My Dawgs got blistered and whooped on by the hated, despised, horrible, terrible, monstrous, grotesque, ugly, stupid, stupid, stupid Florida Gators. I'm in deep mourning. But at least my Falcons are doing awesome, with the best rookie QB since Peyton Manning. It's a done deal, folks: NFL Rookie of the Year 2008 is Matt Ryan. 9. My agent is awesome. Have I said that recently? Well, he is. So there. Well, it's good to be back. I hope all is well in your neck of the woods, and we'll talk again soon.